FlashPoint Results shows you who shared your newsletter with their social networks – on email address level – this helps you reach out to your social influencers! By studying your reports you can see who your socially engaged users are and how far your campaign reaches. Social sharing means that your brand is being exposed to a huge number of potential clients. Once shared on Twitter, your newsletter can be re-tweeted and commented on indefinitely. On Facebook, you can gain Likes for your newsletter – by adding a LIKE button to your newsletter header. 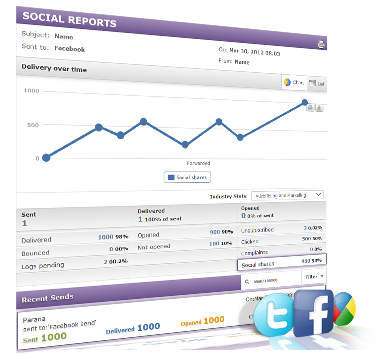 Our reports offer you an easy new way of tracking how much exposure your email campaigns are getting through social media.